I love practical gadgets, things that can not only really make life easier, but actually get you out of a bind when the poop hits the fan. The way modern life is for most of us, your mobile device is never far away, often, never out of your hand. Manufacturers have spent billions investing in battery tech to provide enough power to enable your device to withstand heavy or prolonged use, but there are times when it’s just not enough. 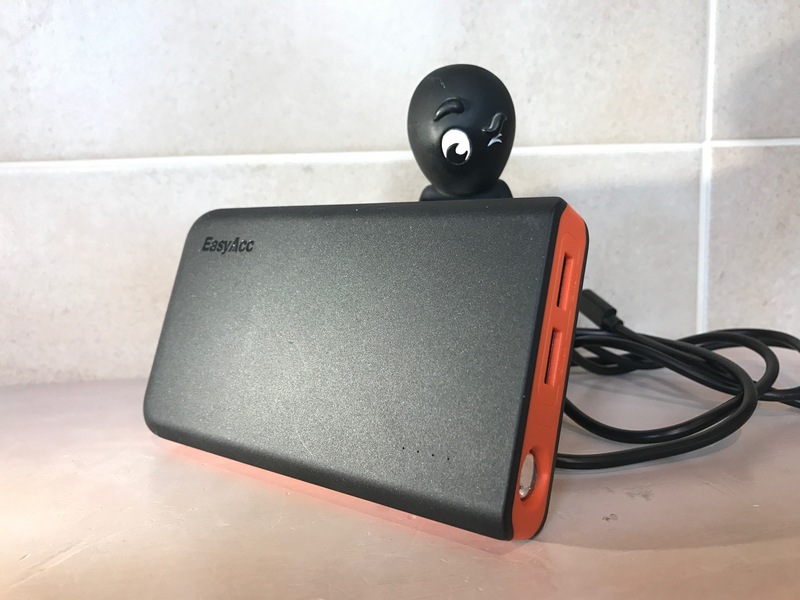 There are many portable power packs available as a solution to this problem and both manufacturers and users are starting to figure out just how essential these devices are – for emergencies as well as daily use. This means that we are seeing increasingly inventive and innovative tweaks, refinements and improvements in them. The model I have been looking at recently is the EasyAcc 13,000mah power bank. A fairly standard looking device that houses a couple of neat little features. Honestly, first impressions aren’t great. The unit comes in a very plain cardboard box and while it isn’t unattractive with its grey and orange colour scheme it feels rather plasticky. It doesn’t feel flimsy, but it does feel a little…….cheap. I have noticed from using it, the plastic does mar and scratch quite easily. The pack itself is a decent size and I personally think it strikes a good balance of capacity, physical size and weight – your mileage my vary. All pretty standard so far. However, under the device are two micro USB cables and that’s where things start to get interesting. Two output ports is nothing new, but the party piece of this little device is the dual input ports. You can plug in two micro USB cables to the two ports and charge the device in half the time. This is genius! EasyAcc claim that a full recharge can take as little as 3.5 hours and in my testing, this seems pretty accurate. This is a fantastic feature for travellers who are maybe camped out in an airport for a few hours, or even if you are just topping the battery up at home and don’t have the time that it would take to charge a regular pack of this size. The output proved pretty good too. The EasyAcc charged my iPhone 7 from 20% to full in a little over 80 minutes thanks to its smart charge function. It has, of course, the now obligatory little LED light, which are generally pretty useless, but in this case, they have put a reasonable sized parabolic lens over the LED to amplify the output and provide a bit more of a useful amount of light. Nice touch! I have been really rather impressed by this charger. Yes, it feels a bit cheap, but it still manages to feel solid. EasyAcc have chosen to forgo the flashy materials, packaging and little carry pouches in favour of functionality. The inclusion of the two charging cables is a real bonus too. For £18.99, this is an easy recommendation.